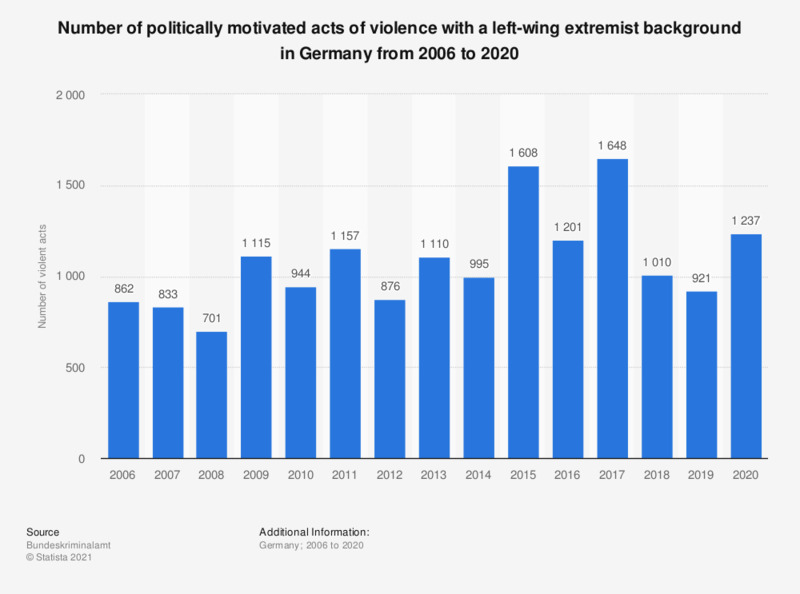 This statistic shows the number of politically motivated acts of violence with a left-wing extremist background in Germany from 2006 to 2017. In 2017, the number of violent acts which were motivated by left-wing extremism was 1,648, compared to 1,201 the year before. * Acts of violence with an extremist background in the area of "politically motivated crime - left". The data for the years up until 2015 were taken from earlier editions of the Annual Report on the Protection of the Constitution. Everything On "Politically motivated crime in Germany" in One Document: Edited and Divided into Handy Chapters. Including Detailed References. Statistics on "Politically motivated crime in Germany"
Is right-wing or left-wing extremism a (very) big threat for democracy in Germany? Is enough being done in Germany against right-wing extremists? Do you think that each of the following situation regarding antisemitism is a problem or not in Italy?